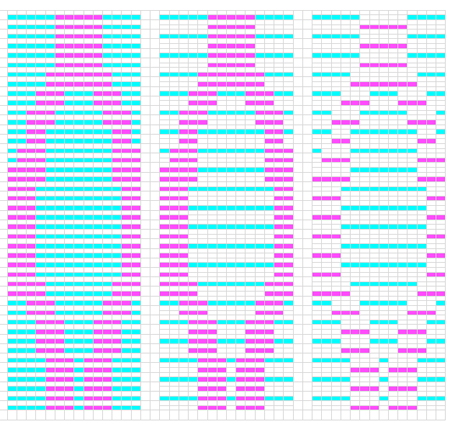 A lot has been written on the use of excel in knit charting, I don’t believe there is anything “out there” on doing same with Numbers. After my latest OS upgrade, I thought I would revisit playing with the updated program. This is not a tutorial as such, just a sharing of some results and observations on this particular effort. For the design I used the same motif as in the last post on 2 color drop stitch on Japanese machines. Under the table menu, there is an option to split rows or split columns. This can be achieved on any selected area, without affecting the remainder of the spread sheet. Copying and pasting the split image over an area of full size cells will change its format, and in turn allow for splitting again. 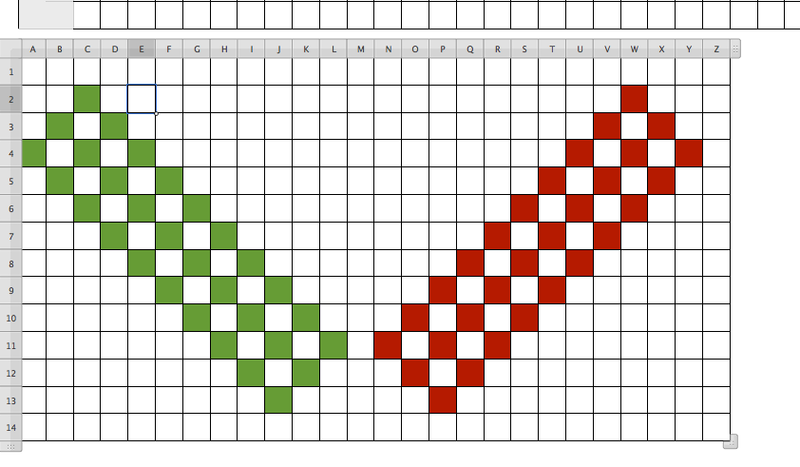 In the image below A is the original motif, B the first split after selecting only those colored cells, C repasting B in an area of full size cells, D selecting and splitting C to achieve elongating the original motif X 4. This particular method works on even motifs with an even number of colors, as splits double existing rows. Row and stitch numbers, text etc may all be added. The image below does not refer to color separations. It illustrates the ability to go twice as long, twice as wide through using splitting rows, and in turn, splitting columns. Twice as wide used alone comes in handy for any knitting on every other needle, sometimes used for thicker yarns on the standard machines that do not have the ability to do that via electronic programming. 4/30/2018: the feature described below in 2012 disappeared from later versions of numbers, I am presently using version 5.0. 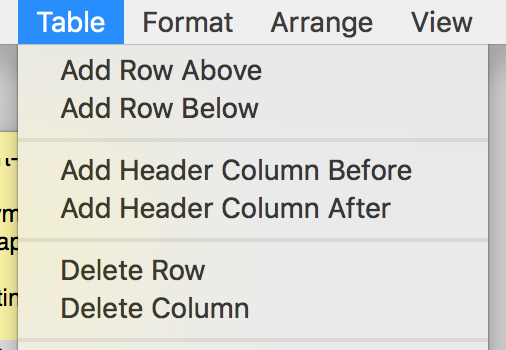 Later versions offered these options for working with rows and columns. The highlighted row will be duplicated, a slower process than simply splitting cells. A positive feature is that an individual table may be changed while still within view on other tables on a single sheet, without globally affecting the document. While playing with more table options today I sorted out a way of creating blank rows between design ones, possible charting use still tbd. Though the results from such charting are not capable of being downloaded directly into knitting software, they are a good way to sort out repeats and begin understand and create any necessary color separations. 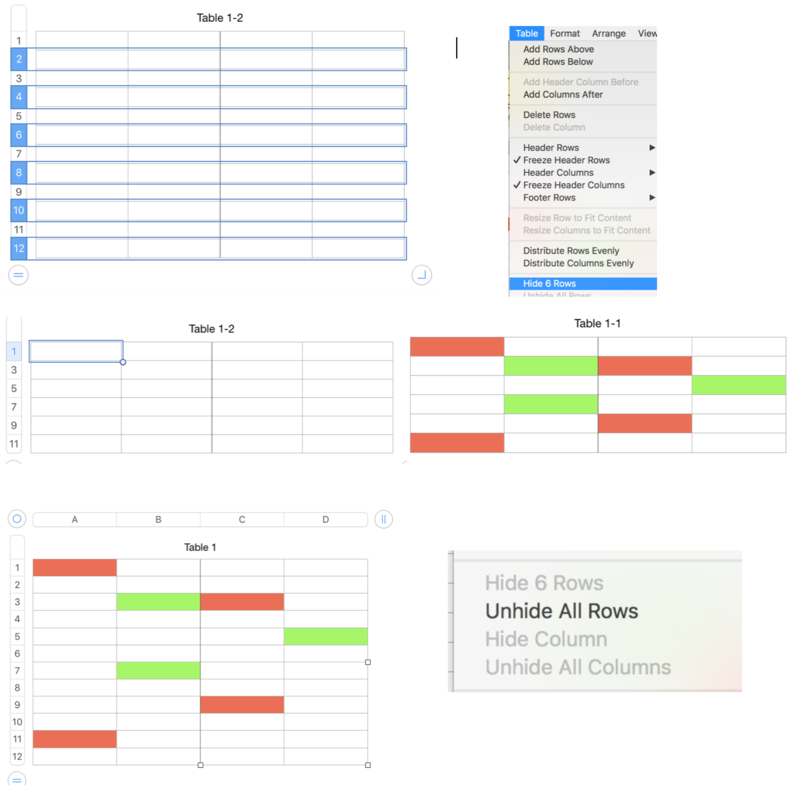 By holding the command key, rows on the table can be be highlighted and hidden as a group. I chose all even numbered rows. The repeat then is drawn. When it is complete, rows originally targeted for hiding are “unhidden”, leaving the design motif with a blank row between each design row, at twice its length. Hiding could take place at irregular intervals as well. simply select all, click on line at bottom of any numbered, grey row cell on left of table, and resize to match the remainder of your document, when desired measurement is achieved, release the mouse and the document cells will be uniform in size. This is super interesting to me. 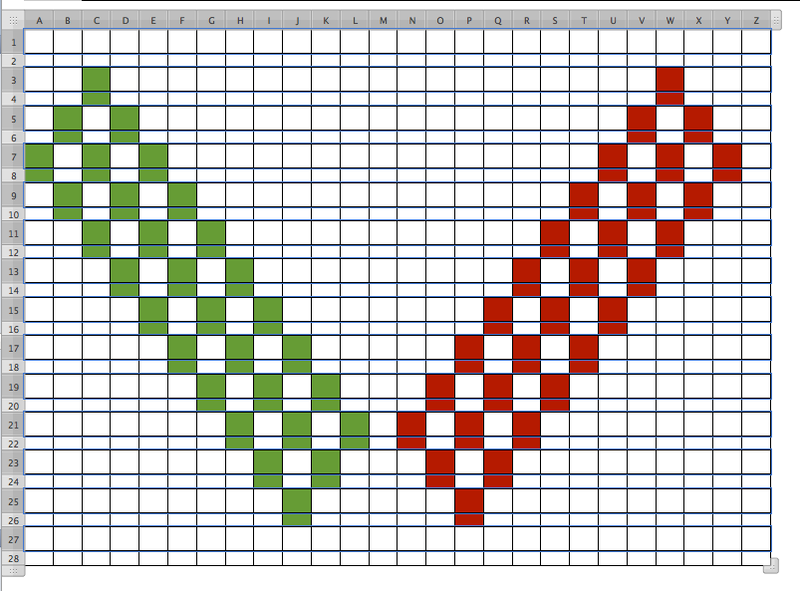 I have been working with different ways of separating rows for color for some time. 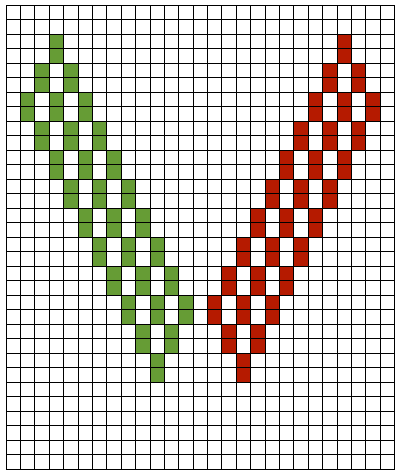 One thing I’m working on is developing a way to split rows for shadow/illusion knitting for which I would like to use the Brother Garter Carriage to knit it automatically. This shows great promise for that effort. 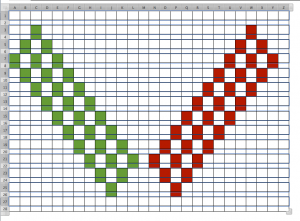 Next Next post: Charting knits in Excel.